Starting at $103.95*, SHIPPING INCLUDED**, 8-10 servings. Build your own, custom stuffed pizzas! *Base price for Mozzarella Cheese Pizza. Additional ingredients at extra charge. 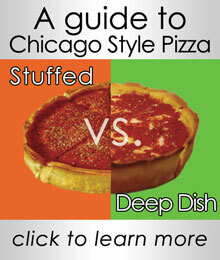 Now you can have our famous Chicago-Style Stuffed Pizza shipped anywhere in the continental U.S.! Each Ship-A-Pie box goes out with your choice of two, made to order, 12" stuffed pizzas. Each pizza serves 3 to 4 adults. We par-bake, flash-freeze and pack your pizzas with a high-tech reusable refrigerant, extra pizza sauce and baking instructions. Shipping Information: If you place your order before 5pm on Monday or Tuesday, Your pies will ship UPS the next day. Orders placed Wednesday through Sunday will ship the following Monday. Transit times vary depending on distance, but will arrive on average in 2 days. 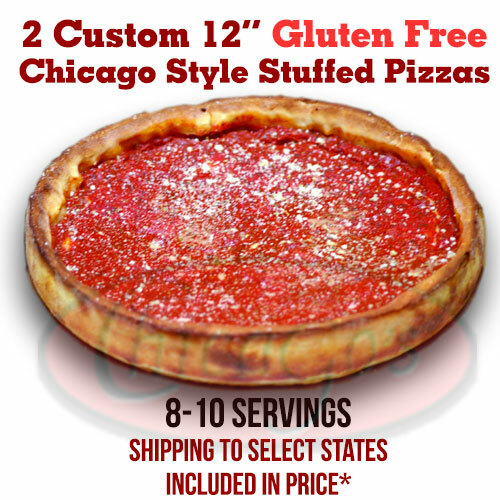 Overnight shipping can be requested and will be quoted depending on distance from Chicago. **Please Note: Due to rising transportation costs, Only orders shipping to MN, IA, MO, AR, WI, IL, MI, IN, KY, TN, OH, NY, PA, NJ, DE, MD and CT are eligible for "shipping included" pricing. Discounted UPS overnight and 2 day shipping rates are available at checkout for all other states.